Sorry it's been a bit quiet on the blog lately. EliFab has been consuming all my time, which is a good thing. I mentioned I was working on something in my previous posts and if you follow me on my social media pages, you would have seen my posts on Friday. I was too busy, I didn't get the chance to post on here. Anyways, EliFab is now an approved Zulily vendor. We ran our first event over the weekend and it was a success. Needless to say I spent the whole weekend crafting pretty bows and headbands. Excited about this new opportunity/partnership and can't wait to see what the future holds for EliFab Accessories. I posted this dress in my Shop my Closet Widget months ago and finally got to wear it recently. 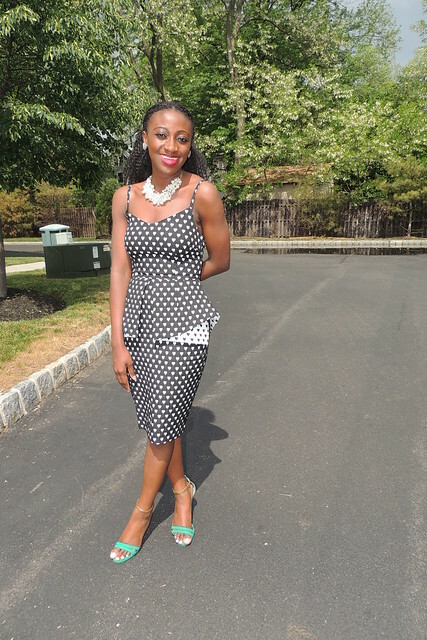 Black and White, peplum and hearts all over. Sounds like the perfect dress to me. Added a chunky pearl necklace and green sandals to complete the look. you look great! loving your dress! Love the dress, it's so fab! This is wonderful! Congratulations, I have a feeling even greater things are in store for you!